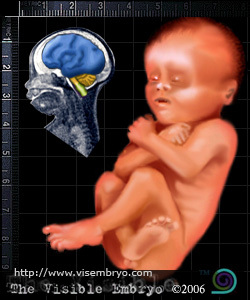 Fetal size: weight almost 2.4 pounds (1.1kg). Crown-to-rump length is close to 10 inches (25cm). Total length is 15.75 inches (35cm). Mother's size: Uterus is about 3.2 inches (8cm) above bellybutton. If measuring from the pubic symphysis, about 11 inches (28cm) to the top of thte uterus. Weight gain should be between 17 and 24 pounds (7.7 and 10.8kg). Fetal brain's surface appears wrinkled. These convolutions provide more surface area and maximize brain cells. Rhythmic beathing and body temperature are now controlled by the brain. Lanugo hair has disappeared almost completely, except on back and shoulders. Head hair is present. Production of red blood cells is entirely tasken over by the bone marrow. Skin begins to smoothen as fat deposits accumulate underneath. The fat insulates and is an energy source.